AArk activities include working with organizations and projects throughout the world that are currently seeking external support and partners to help with their amphibian conservation projects. Assistance may be in the form of funding, specialized staff or training skills, volunteering or in-kind support in the way of equipment and supplies. We are currently focusing our efforts on eight programs that are working with species assessed as requiring urgent rescue into captive breeding programs to ensure their survival. 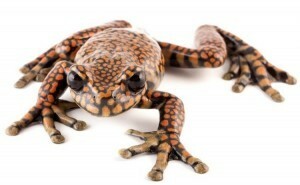 These programs appreciate your support to help save threatened amphibians! 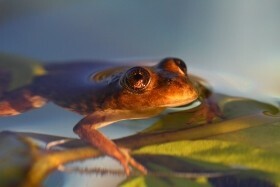 An additional list of amphibian programs which require additional support can be found here. 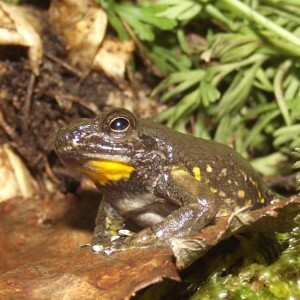 To help the recovery of Valcheta Frogs, the Wild Plateau Initiative was created in 2013 and started working with the goal of doubling the distributional range and population size of this Critically Endangered species. In this framework we established a survival breeding colony in the first and only ex situ rescue center for endangered amphibians in Argentina. Association Mitsinjo, a community-run organization founded by villagers in Andasibe, has launched Madagascar’s first amphibian captive breeding facility. 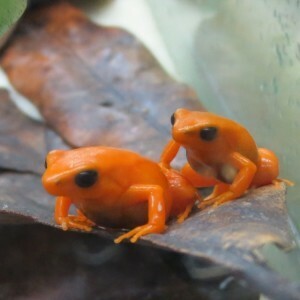 The facility is fully functional and is run by a team of eight Mitsinjo technicians, who are maintaining more than 100 terraria housing eight local species, including a captive assurance colony of the Critically Endangered Golden Mantella Frog, one of Madagascar’s most threatened amphibian species. The Alcatraz Snouted Tree Frog, Scinax alcatraz is a tree frog, endemic of Alcatraz Island and is listed as “Critically Endangered”. Part of the island belongs to the Brazilian navy, and it is used as a target practice by navy ships. This practice often cause spot fires on the island and consequently destroy the bromeliads, the habitat of the tree frog. For this reason the establishment of a captive breeding program, as well as maintaining a viable population in captivity at the Fundação Parque Zoologico de São Paulo in Brazil, is really necessary and urgent. Donations to this project will go towards raising public awareness of this plight of this species. Sao Paulo Zoo is planning to have some of these frogs on display and new educational materials are needed at the exhibit to link to the conservation project and to raise awareness with zoo visitors. Donations to this project will help with periodic nutritional supplements, monitoring of wild remnant populations, regular financial support for personnel and infrastructure maintenance. 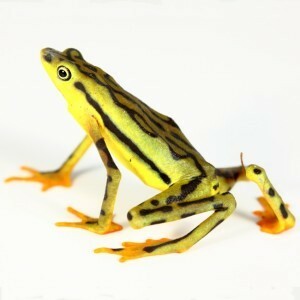 The Venezuelan Andean Reptile and Amphibian Conservation Center was established in 2012 within the Chorros de Milla’s Park Zoo, in the city of Merida, with facilities expressly developed for the conservation of several endangered species endemic to the Cordillera de Mérida, the largest mountain range comprising the Venezuelan Andes. 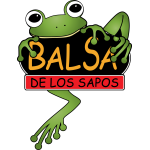 Here, staff will manage captive conservation programs for six species of endangered Venezuelan frogs (Mannophryne cordilleriana, M. collaris, M. speeri, Atelopus sp. 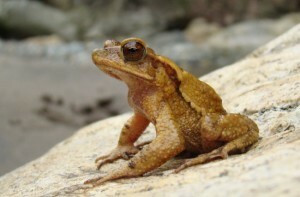 (undescribed), Leptodactylus sp. (undescribed) and Aromobates leopardalis). This program will breed these Andean endemic and endangered species for future reintroduction to the wild. The project started with Mannophryne cordillerana. This conservation program also involves habitat protection awareness among local people, in situ and ex situ research, and a long-term monitoring study of the focus species. Donations to this project will help with establishing new terraria including filters, lights, food and water pumps, field equipment, and will help provide training for additional amphibian keepers. Africam Safari in Puebla, Mexico, has established a captive breeding program for the Critically Endangered Large-crested Toad, Incilius cristatus. This program resulted in successful breeding for the first time in December 2012 and again in March 2013, with the release of some of the captive-bred toads into the wild by local schoolchildren from the Xocoyolo community. The design of a new building at the Jambatu Centre in Quito, Ecuador signals a critical chapter in the life of the center. It represents, on one hand, an important step towards improving the conditions of Jambatu’s labs and ranaria, and on the other, it shows a desire to share the center’s work with the local population—to bring the public into the sciences, to bring science into daily life. 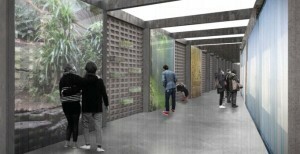 The construction of the new center will start with the Public Frog House, to be completed in December 2014. Currently, the Jambatu Center has secured funding for 70% of the first phase of the project and is seeking for sponsorship from people or institutions interested in supporting the link between science and public awareness. Your support will help this exciting new project to become a reality, and to further promote our amphibian conservation work in Ecuador. 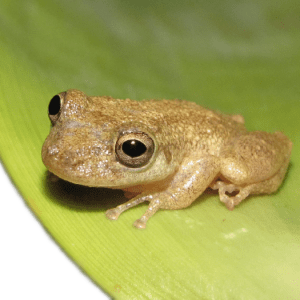 Dr. Luis Coloma and his team at Centro Jambatu in Ecuador are instigating a new project to conserve the endangered Prince Charles Stream Tree Frog (Hyloscirtus princecharlesi) and its native habitat in the Ecuadorian forests. The main goal of the project is to develop activities that will result in the long-term conservation of the Prince Charles Stream Tree Frog, including strategies in the wild and in captivity. to produce a web page with education materials such as a field guide of stream tree frogs and a web site of Hyloscirtus princecharlesi.